The protein electrophoresis test measures blood levels of different types of proteins. This SPEP test is sometimes used in helping assess multiple myeloma or a gammopathy. What is a protein electrophoresis test? A protein electrophoresis test is a blood test used to check separate serum protein levels. What proteins are tested in the protein electrophoresis test? This test panel measures the levels of albumin, alpha-1, alpha-2, beta-1, beta-2 and gamma. This Protein Electrophoresis Test is a blood test. The protein electrophoresis test, also known as an SPEP blood test and SPEP lab test, measures specific protein blood levels. The SPEP blood test measures six fractions of proteins (globulins) - albumin, alpha-1, alpha-2, beta-1, beta-2, and gamma - using a serum protein electrophoresis methodology. These fractions are helpful for evaluating protein abnormalities such as multiple myeloma or a monoclonal gammopathy. To get a protein electrophoresis blood test near you, just order online and get your blood drawn at the Quest Diagnostics lab. Once your protein electrophoresis lab report is ready, it will be available for download. 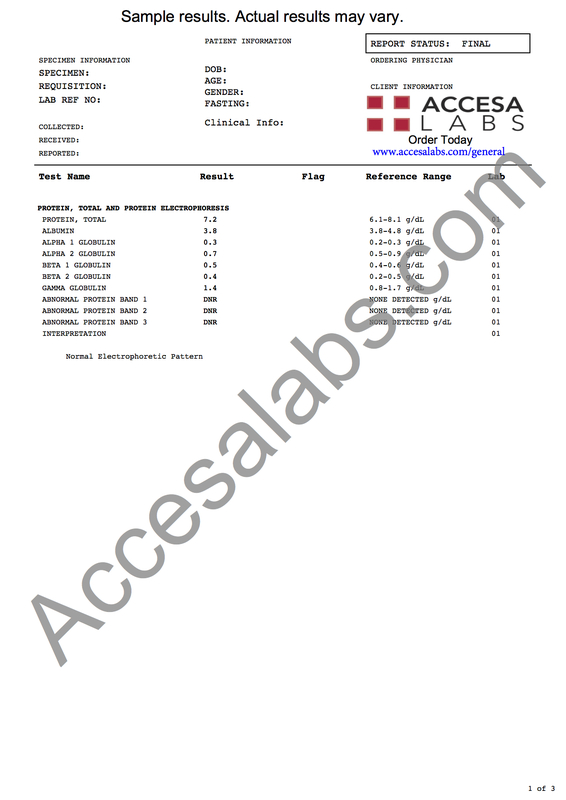 As can be seen on the sample protein electrophoresis lab results above, the protein and globulin blood levels are reported as numbers which can be compared against the reference ranges provided by the lab. Protein Electrophoresis Test at Guaranteed Prices.